Sheffield Council has admitted the controversial contract being used to fell thousands of trees in the city states the authority is not liable for extra costs caused by protesters - days after it was claimed the actions of campaigners had put it at risk of “catastrophic financial consequences”. But the council said that PFI contractor Amey may still seek to recover some or all of the "major costs" it has incurred from protester actions from the public purse. Campaigners unhappy with the Streets Ahead programme to remove and replace 6,000 of the city’s 36,000 street trees as part of highways improvements had been standing directly under trees to prevent them being chopped down. But after the council won injunctions to prevent such protests last week, Councillor Bryan Lodge said the court action had been a "last resort" and the council had “a responsibility to the taxpayers of Sheffield to do everything we can to avoid catastrophic financial consequences if the Streets Ahead work is not completed by the end of the year”. Coun Lodge then told BBC Radio Sheffield the penalty to the council “could be into millions”. But an examination of the Streets Ahead contract by The Yorkshire Post showed the terms state any loss of income relating to protests should be borne by Amey and not the council. Sheffield Council today said while the contract does suggest the costs relating to protesters should be carried by Amey, “the situation is extremely complex” and the firm may seek to recover costs from the authority. It said other delays have been caused by the council establishing an Independent Tree Panel to advise on felling decisions, as well as ordering removals not to take place before 7am in the wake of a controversial pre-dawn operation to remove trees on Rustlings Road, which resulted in three arrests. The council said last week that the court ruling would allow it to “accelerate” the removal of 500 trees that it says need to be felled by New Year as part of the ‘Core Investment’ stage of the 25-year, £2.2bn PFI contract to make highway improvements across the city. 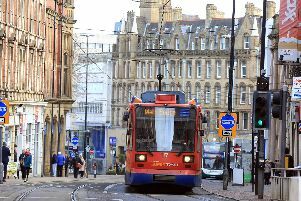 But a spokesman for Sheffield Council said today: “There are many contractual issues if the Core Investment Programme isn’t delivered on time. This programme is the first part of the 25-year contract and is when the bulk of the upgrade work takes place. “Precise estimates have not been made about the cost of any delays but the scale of the costs are unaffordable for the council when its budgets are under so much pressure. “We know that some of the costs of delay result from council decisions such as the Independent Tree Panel, delays on specified streets or the decision not to start before 7am. These costs will have to be met by the council. Beyond that, Amey has incurred major costs resulting from protester actions. The contract suggests these should be costs to Amey. Sheffield tree campaigners marked the first day of an injunction against them with a protest outside Amey’s depot. A group of protesters gathered outside Olive Grove in Heeley, where the company’s tree-felling crews are based, from early morning yesterday. Many wore costumes, including wigs and dressing gowns, along with masks of city councillor Bryan Lodge and environment secretary Michael Gove. Some had signs saying ‘persons unknown’ - a reference to the injunction granted by a High Court judge that puts anyone protesting inside safety barriers around trees in contempt of court. Police turned up to monitor the protest at about 10am, with some campaigners ‘slow walking’ in front of Amey vehicles. Among those in attendance was Green Party councillor Alison Teal, who was among the three named persons given injunctions preventing them standing directly under trees to prevent their removal. “What we are here to do is let them know we haven’t gone away on the first day the injunctions have come into force,” she said.